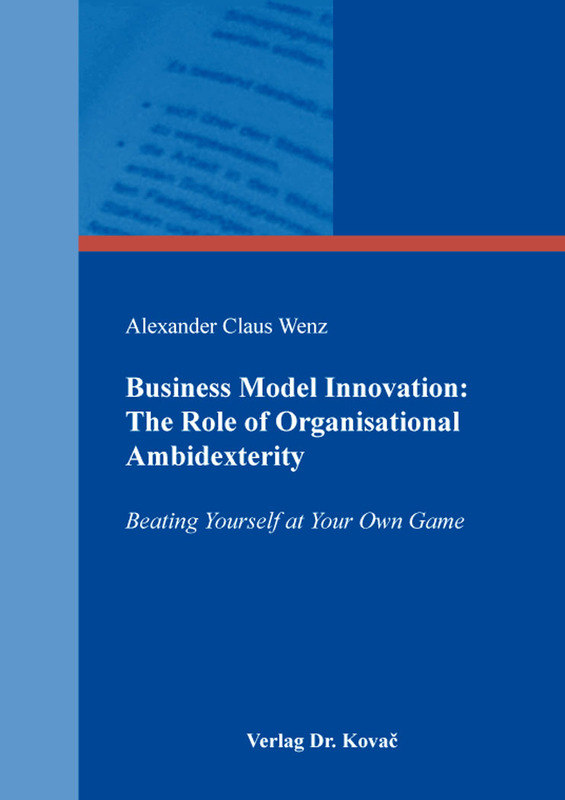 Business Model Innovation: The Role of Organisational Ambidexterity. Dissertation von Alexander Claus Wenz, Verlag Dr. Kovač 2018, 198 S.
This book’s overall aim is to enhance the understanding of the BMI phenomenon by examining certain causes, means, and consequences that surround it, to eventually derive both theoretical and managerial implications. To achieve this goal, the rich knowledge of organisational ambidexterity theory is utilised and interweaved with BMI theory. The writing is structured into five chapters. Enclosed by an introductory and conclusive chapter to interweave individual goals and findings of the entire writing, the principal body of this work is partitioned into three chapters. Chapter 2 takes advantage of well-known theory about organisational ambidexterity to assess the context of BMI by examining (a) the links between BMI, exploring and exploiting activities, and structural configurations, (b) the characteristics of parallel BMs-related conflicts, and (c) organisational ambidexterity’s capacity to manage conflicts. An inductive approach is adopted utilising in-depth data from 22 interviews. The findings suggest that tensions between multiple BMs encompass various conflict types and explore organisational ambidexterity measures to manage their effects. Chapter 3 generates quantitative evidence that interrelates BMI, multiple BMs-related conflicts, firm performance, and ambidextrous designs. A dataset of 369 German companies is analysed in this quantitative study, utilising a deductive approach to examine (a) the relationship between BMI and performance, (b) the influence of multiple conflicts on the relationship between BMI and performance, and (c) organisational measures’ influences on relationships between BMI, conflicts, and performance. The conclusion confirms the anticipated relationships and highlights ambidextrous organisations to untighten multiple BMs’ conflicts. Chapter 4 investigates different integration strategies for both temporary and permanent organisational structures. Making sense of a dataset of 369 German companies, this quantitative study utilities a deductive approach to analyse (a) the firm performance benefits of integration efforts along various periods in the BM’s lifecycle and (b) the firm performance benefits for different degrees of integration between parallel BMs.